We built an all new website, with blogging and social media as a large part of the strategy, in order to better educate not only our potential customers, but also to position Cerasis as the expert they are in the logistics marketplace. Cerasis, Inc., a top logistics company offering freight management services, freight technology, and eCommerce freight solutions, announces the implementation of a brand new logistics website and robust marketing plan to include such digital channels as social media, press releases, webinars, email marketing, and content marketing. Cerasis, Inc., founded in 1997, has grown in revenue each year since, all while not investing in a formal marketing department. This growth, by mostly referrals and cold-calling is a testament to the innovative and sustainable technology products, services, and people Cerasis provides as solutions to customers. However, as competition and technology in the less-than-truckload and transportation management industry has increased over the years, and with a goal for Cerasis to grow aggressively over the next 10 years, it was vital to invest in marketing in order to reach large manufacturers and distributors who ship millions in freight volumes per year and who have multiple locations. In fact, the larger the shipper, the more value Cerasis’ products and services bring to the end customer, especially in the realm of freight data analysis, freight accounting, and supply chain visibility. The first order of business in bringing on a Director of Marketing was the development and creation of marketing messaging to live on all public facing marketing and sales collateral so that when customers were given a link to Cerasis.com, sent an email, receive a call, or given a flyer at a trade show, there would be consistency as well as the clear communication of the products and services offered by Cerasis, thus creating the right expectations throughout the entire customer experience. 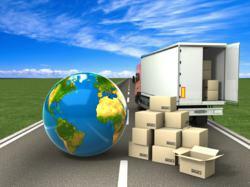 The world of logistics solutions is an industry with such varying definitions and riddled with jargon, especially in the sales process, that there are many end customers who ship freight, such as manufacturers, distribution and ecommerce companies, who are often confused as to the specific products and services offered by logistics service providers. This confusion often leads to hiring an outsourced logistics company who does not best fit the needs of the shipper and thus the relationship does not yield holistic cost savings found not only in hard costs of transportation, but also not the mitigation of risk and the potential to scale swiftly as the shipper grows and ships more freight. Once marketing messages and goals were established, Cerasis, in an effort to decrease jargon and confusion, then built and launched an all new Cerasis.com design and copy to include pages featuring the Cerasis leadership, management, sales, and operations staff, as well as laying out the specific services, technology, company contact information, and of course a login page for customers and carriers to access Cerasis freight technology, the Cerasis Rater and CarrierLINK. The most active portion of the new Cerasis.com is the “Freight Management Blog” featuring a new blog post each business day on best practices, trends, and insights into the worlds of Manufacturing, Distribution, Logistics, Technology, Supply Chain, 3PL, and Freight Management. Along with each blog post, the entire website also features search engine optimization for Cerasis visibility in search engines so those searching for the products and services around freight logistics and technology. In addition to an all new website, search engine optimization, and an industry leading blog platform, Cerasis will deploy as part of the overall marketing business plan, content marketing via blogs and video, email marketing, educational webinars, industry white papers, trade shows, online advertising, traditional advertising, and an active presence in social media on platforms such as Twitter, LinkedIn, Facebook, Google+, Pinterest, and industry specific platforms.